Tuberculosis (TB) is an infectious disease caused by the mycobacterium tuberculosis bacteria. It is spread from person to person through air. When people with lung TB cough, sneeze or spit, they release TB germs into the air. A person needs to inhale only a few of these germs to become infected. Though the lung is the most common organ affected, tuberculosis can affect virtually any organ of the body—lymph glands, brain, bones, joints, intestine, pericardium, pleura, genitourinary tract. Around the world, TB is a health challenge as it is one of the leading causes of death, especially in children, smokers and patients with HIV (human immunodeficiency virus) infection. Nevertheless, tuberculosis is curable and preventable. The common symptoms of active lung TB are cough with sputum and blood at times, chest pain, weakness, weight loss, fever and night sweats. Often, patients have prolonged duration of fever, ill health and weight loss. Underlying diseases, malnutrition, diabetes and age-associated decline in immunity make the elderly prone to tuberculosis infection. Frail elderly residents of nursing homes and other long-term care facilities are the most susceptible. Clinical features of TB in older adults may be atypical, like low-grade fever, weakness, functional decline, loss of appetite and weight loss. These can be confused with age-related problems, causing delay in diagnosis. High index of suspicion is necessary to avoid delay in the diagnosis and start treatment as soon as possible. Tuberculin test, sputum examination, and radiologic tests like x-ray and CT scan are required. However, culture of the TB bacteria remains the gold standard for diagnosis. Biopsy and histopathology are required at sites other than the lungs. Tests for drug-resistant tuberculosis can be performed on the samples. Rapid tests for identification of TB and drug resistance—GeneXpert—are now available. Active, drug-sensitive TB is treated with a standard six-month course of four antimicrobial drugs. 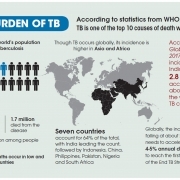 The majority of TB cases can be cured with proper and timely medication. The treatment of drug-resistant tuberculosis is complex as drugs are toxic and patients need to be supervised for possible side-effects, which include hepatitis and diminished vision. Streptomycin is usually avoided in the elderly because of its effect on hearing and the kidneys. TB is mostly treated on an outpatient basis. Hospitalisation is indicated if there are complications like intolerance to drugs leading to vomiting, severe liver dysfunction or a surgical complication like intestinal obstruction owing to abdominal TB. It is important that even though there is a symptomatic feeling of well-being in a few months, the entire course of medication as per the physician’s instruction should be completed to prevent relapse, recurrence and resistance development. Regular follow-up with the doctor, supervised medicine administration, good nutrition and a diet high in protein help in early recovery. As pulmonary tuberculosis is highly infectious, early detection of TB cases and prompt isolation and treatment of infectious cases help prevent transmission and spread to family members and others. Maintaining high standards of hygiene and cough etiquette to avoid airborne transmission are required to prevent the spread of TB bacteria. The prevention of TB requires close collaboration between society, healthcare providers and the Government. The National Strategic Plan has proposed strategies to eradicate TB in India by 2025, much ahead of the WHO’s End TB Strategy (2015-2035 with milestones set every five years) under the Sustainable Development Goals. 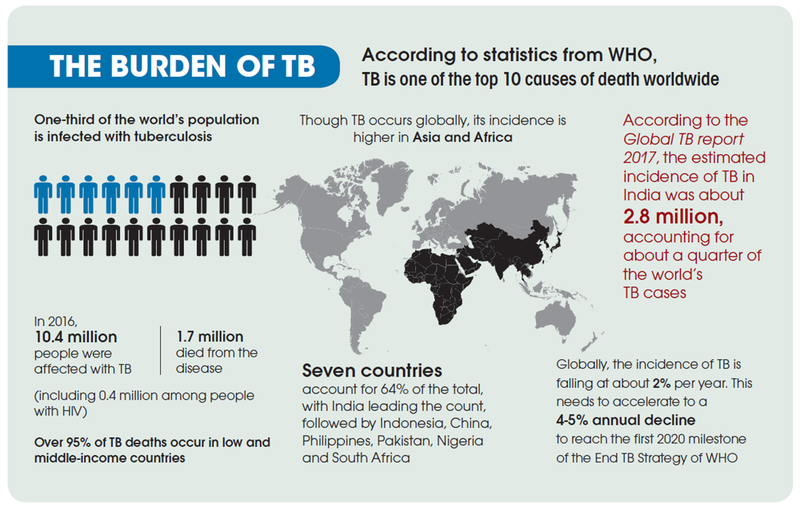 Let’s hope for a better tomorrow and a world free of TB!